We spent Easter weekend in Arezzo with hubby’s parents and I spent the better part of the weekend cooking along side mamma, showing her how to make granola, making pizza, and preparing Easter lunch which included my nut stuffed artichokes and my roasted cauliflower and brussels salad, which were both a big hit. Everyone requested muffins for breakfast the next day, but sadly they were a flop since I didn’t have all the essential ingredients on hand, the shops were all closed and my McGyver attempt at subbing both baking soda and baking powder with cream of tartar and vinegar failed miserably. They were a dense mess to say the least. I don’t know what I was thinking and deep down I knew it wouldn’t work but I was hoping for some sort of miracle. 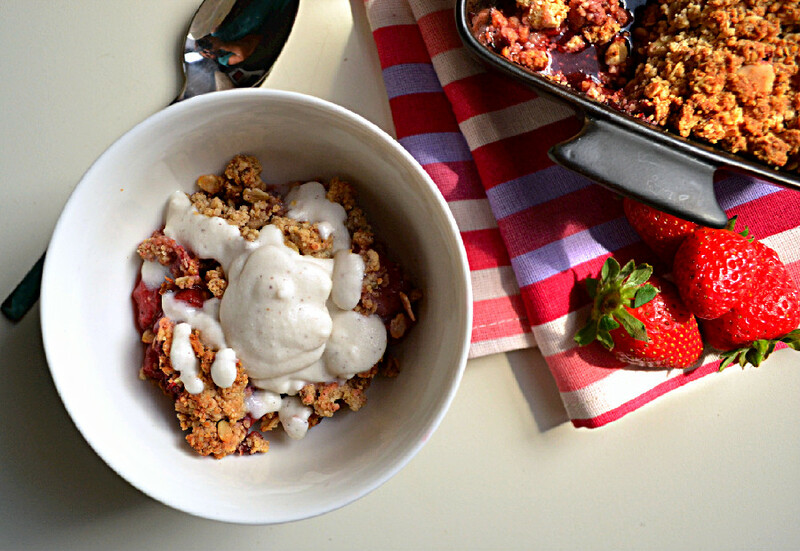 The next morning I remedied all with strawberry crisp for breakfast. We had lovely local organic strawberries in the fridge and tons of almonds and oats in the pantry. Since we didn’t have any neutral coconut oil and I really didn’t want to use olive oil, I decided on tahini and it worked perfectly. As it turns out, strawberries and tahini were meant to be. Everyone was happy and satisfied and licking their bowls clean afterwards. I grabbed my phone and quickly “scribbled” some notes to help me remember what I did. Once I recreated it in my own kitchen, I took the time to measure and even made a delicious coconut tahini crème to go along with it, #foodgasm alert. I started with chilled coconut milk, which I left in the fridge for almost 2 hours, scooped out the solid cream and whisked in some vanilla, tahini and maple syrup. The result was something more liquidy than a whip cream, but more dense than a pouring cream…I call it crème because everything sounds more sophisticated en français. Strawberries, I’m happy to report, are not only one of the most delicious spring fruits on the planet, but they also happen to be a healthy and powerful fruit with tons of vitamins, minerals and important antioxidant and anti-inflammatory phytonutrients. Strawberries offer cardiovascular health benefits, help to regulate blood sugar levels and provide protection against cancer. They are an excellent source of vitamin C, manganese and dietary fiber. The peak season for Strawberries is April through July and I would generally advise against eating strawberries out of season. They certainly won’t be as sweet and flavourful and the source is often questionable. Also, since strawberries have very pourous skin, they absorb chemicals and pesticides very easily, so I would highly recommend organic and/or locally grown strawberries. 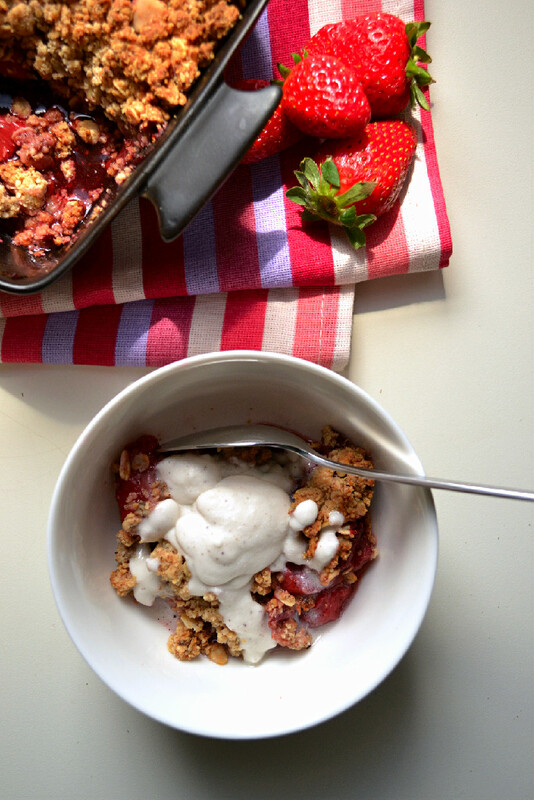 This strawberry crisp is a classic with a twist. It’s vegan, gluten free, refined sugar free and oil free as it uses tahini in place of oil to hold the topping ingredients together, which adds a whole other dimension of flavour that complements the sweetness of the strawberries. It’s very lightly sweetened with maple syrup, as the ripe strawberries do most of the work in that department and served with a fresh cold coconut tahini crème to contrast the warm strawberry fillong and crisp almond oat and tahini topping. Wash, hull and slice the strawberries and toss them with all the other filling ingredients and put them in a small deep oven safe baking dish. Mix all the topping ingredients together until a crumb forms and pour it evenly onto the strawberries, covering them completely. Cover with aluminum foil and bake for about 20-25 minutes. Uncover and bake for an additional 5-10 minutes to allow the top to brown and crisp up. Adjust baking time based on your oven potency. Be careful not to burn the topping, it should be golden and crisp, not dark brown. While the crisp is baking, prepare the coconut tahini crème. Start with a chilled can of coconut milk, scoop out the solid part and reserve the liquid for another use (smoothie/soup/etc.). Whisk in all the other indgredients until you have a smooth thick pourable cream. Chill until ready to use. Once the crisp is ready, scoop into serving bowls or dishes and top with cold coconut tahini crème. Thankfully my McGyver muffins didn’t cause an explosion…lol. The tahini flavour is subtle, but really adds a special touch. Looks so good Nissrine! I absolutely love your tahini crisp ingredients! I make an apple cinnamon crisp that is very similar but use almond butter instead. I love the idea of using tahini instead of course, YUM! Such a beautiful dish! Thanks Brandi. The combo of strawberries and tahini is a real winner. I love the idea of almond butter too…nut and seed butters make such wonderful oil replacements and add so much flavour too.